Did Umar Patek Lead the US to Osama bin Laden? Yesterday, Al Jazeera published a leaked copy of the final report from the Abbottabad Commission appointed by Pakistan’s government to investigate both how Osama bin Laden could have lived within Pakistan (on military land!) for so long and how the US was able to carry out its mission to kill him without Pakistan’s military responding in any way. 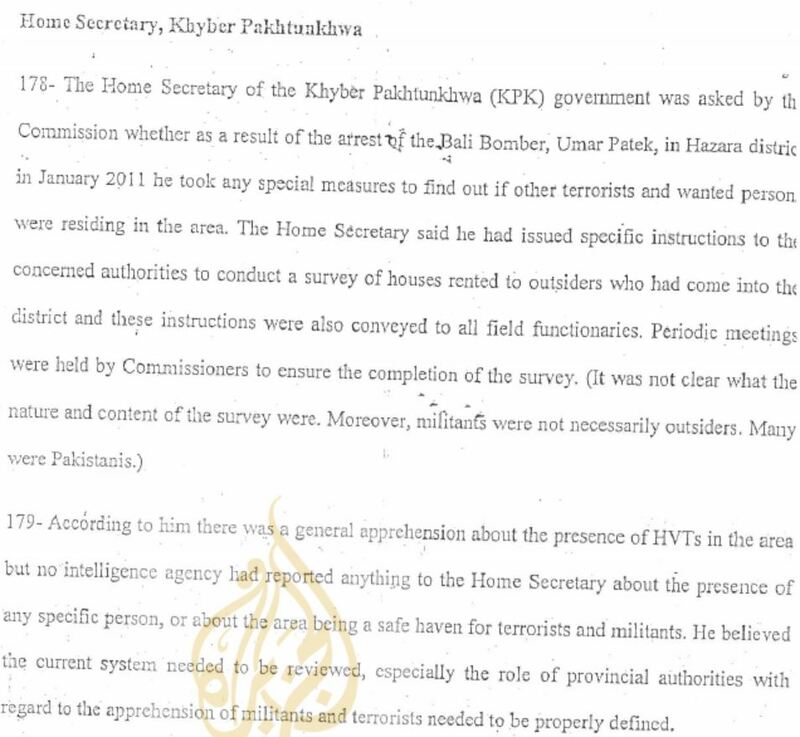 The report is published as a pdf file of what is clearly a photocopy of the report. The English version has a few translation and/or transcription errors where a word here and there does not make sense. The copy is nearly complete, but Al Jazeera notes that every copy they saw was missing a page in which former ISI director Pasha described conversations Musharraf had with the US just after 9/11. What stands out to me in the reading so far is the role that Umar Patek could have played in aiding the US to find bin Laden. Recall that so far, the party line from the US is that bin Laden’s compound was located in Abbottabad by tracing the two couriers who lived there. However, Indonesian bomber Umar Patek was arrested in Abbottabad in January of 2011, just a few months before the May raid by the US. But there’s a question that has, AFAIK, never been answered. Patek was arrested in January 2011 in Abbottabad, Pakistan. There have always been suspicions that the arrest of Patek in the city Osama bin Laden was hidden out in (Patek reportedly planned to meet OBL) helped to solidify the case that he was in fact the “Pacer” in the compound. Did Patek help the US get OBL? Both Marcy and the commission find the interrogation window for Patek to fit extremely well with the timing of the bin Laden raid. The commission also shows considerable insight in noting that despite the efforts by bin Laden to cut off all interaction with the outside world except for the use of his two couriers, at least one high level al Qaeda affiliate may well have known that bin Laden was in Abbottabad. While the world focuses on the role of following bin Laden’s couriers, it may well be that Patek provided some of the most actionable intelligence on bin Laden being in Abbottabad. https://www.emptywheel.net/wp-content/uploads/2016/07/Logo-Web.png 0 0 Jim White https://www.emptywheel.net/wp-content/uploads/2016/07/Logo-Web.png Jim White2013-07-09 10:00:532013-07-09 10:25:00Did Umar Patek Lead the US to Osama bin Laden? good video that i hadn’t seen before.. makes one wonder about all of this..
Jim, this is really interesting. Was the whole thing Zero Dark Thirtied?